That's it for our coverage tonight, as Norwich took their opportunity to extend their lead at the top of the Championship. A reminder: there are two early kick-offs in the Championship tomorrow as we return with more live text coverage of the English Football League. There's significance at both ends of the table in one of them, as promotion-chasing Sheffield United host relegation-threatened Rotherham at 12:15 GMT. We'll also bring you comprehensive coverage of all the action across the three divisions when the 15:00 GMT kick-offs begin. Second-placed Leeds United will be aiming to cut the five-point gap to Norwich when they travel to Bristol City. That win lifts the Canaries five points clear at the top of the Championship. Click the link below to read the report from the action at Carrow Road. Here's what victory over Swansea tonight has done to the top of the Championship. League leaders Norwich City now have a five-point gap to second-placed Leeds. And the Canaries now have a seven-point cushion to third-placed Sheffield United. That puts the pressure on the Whites and the Blades ahead of their games on Saturday. Swansea remain 14th, seven points off the play-offs. All over in Leagues One and Two - and three winners. Burton held on in the end to beat 10-man Coventry, who had Bright Enobakhare sent-off, 2-1. And one goal was enough at both Lincoln and Tranmere, where the home sides beat Yeovil and Crewe respectively. Lincoln are now five points clear at the top of League Two, with a 10-point gap to fourth place, while Tranmere move up a place to fifth. It was a tough game as Swansea played good football. We showed character and impressed in the second half. It was a good statement today, with our performance and the upcoming games. The teams who play tomorrow have to follow us. I think it was a great game for us. We faced a very strong side and had big problems in the first half. It was a hard fight but it is a massive three points. We have done well so far and we know how tough every game is. We need to keep focusing on the next task ahead. Emi Buendia's goal is enough to give the Canaries their sixth win in seven league games. It's just one defeat in 11 in the Championship now and the Premier League is calling. The Canaries are almost there. The fans whistle at Carrow Road. The great thing about not making any substitutions during the second half is that you can then use them to time waste in stoppage time. Striker Teemu Pukki is repalced by defender Timm Klose. Time is almost up. Not long left, and Norwich are running down the clock. Swansea centre-back Cameron Carter-Vickers gets a booking for chopping down Kenny McLean. We will have three minutes of added time at Carrow Road. Norwich goalscorer Emi Buendia was about to take a corner but, as coach Daniel Farke looks to run down the clock, he is replaced by Moritz Leitner. Swansea defender Mike van der Hoorn has to be alert to get to a bouncing ball before Teemu Pukki and puts it behind for a corner. Almost a second for Norwich, and it is Teemu Pukki - who else? - who is denied. His low shot across goal from the edge of the box beats Kristoffer Nordfeldt buts hits the left-hand upright before trickling away to safety. Great delivery by Matt Grimes and Swansea skipper Mike van der Hoorn gets a good head on it. The ball goes over the bar. How are your nerves, Noriwch fans? A late corner for the hosts to defend as the ball goes behind off Emi Buendia. Norwich striker Teemu Pukki gets in the box and looks to be in a decent position. But then the Finn loses the ball under his feet, is dispossessed and commits a foul. He's scored nine goals in his last eight games but looks like he will draw a blank tonight. Here's another look at Emi Buendia's goal, which separates the sides at Carrow Road. 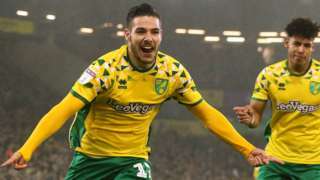 As things stand his strike is putting Norwich five points clear at the top of the Championship, and carving out a seven-point gap to third place. First change for Norwich, as Mario Vrancic comes on for Marco Stiepermann. Swansea get another free-kick on the left flank. Matt Grimes is stood over this one with Bersant Celina. Celina takes and squares it to Barrie McKay, and his shot from distance is miles off target.